Delicate curves coupled with a darling design. Volterra [vol'tɛrra] is a town in the Tuscan region of Italy’s rolling countryside, founded in the 7th century BC and worldwide known for the extraction and production of alabaster. This magical city is the inspiration for the Volterra Collection. We know that nothing is more magical than bringing home your new little one, and the Volterra Baby Collection provides the perfect nursery to come home to. A delicately curved molding piece along the top of the crib frames the bed and hints at sweetness and style. With a wooden mattress support system, you can be assured that your baby is being well supported during sleep. 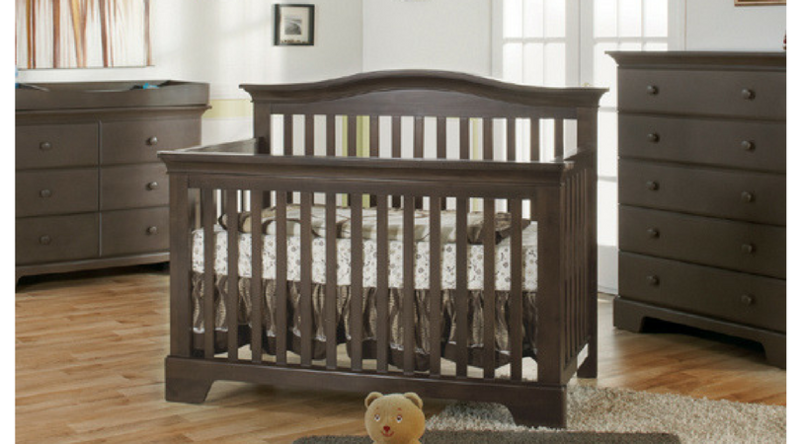 Designed with sturdy feet and a classic railing around the bed, this crib can easily transition to a toddler bed, a child’s day bed, and a full-sized bed providing years of style in your home. The finish on this furniture is non-toxic, and all of our finishes are regularly tested to ensure that they exceed the required standards for lead. Because of our commitment, you can be sure that your purchase is both safe and stylish.